This awesome polish is called Frost Bites. 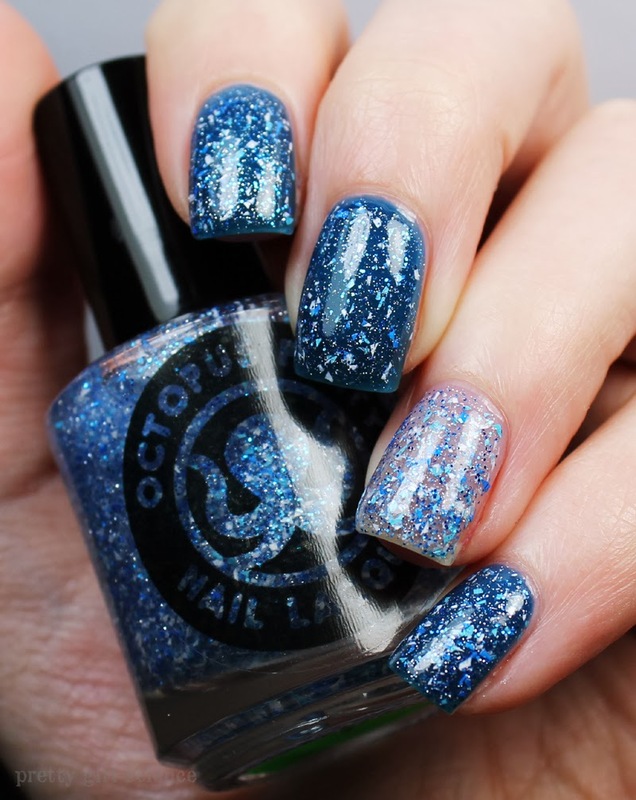 Its a mix of shredded, micro, and extra-tiny glitters in a clear jelly base. It is completely different from anything I currently have, and I love it. It reminds me of a blizzard...as interpreted by 1960s clay-mation. It is very dense, but I don't think it could be built up to opacity. I'm actually OK with that, because it is just dense enough that it doesn't require the dabbing that some glitters do. It brushes on evenly, which is such a nice surprise. Seems to be that the most amazing glitters need dabbing and prodding to get a good layer...and I hate that with an all-consuming rage. On my index, middle, and pinkie I used two coats of Ink or Swim under two coats of Frost Bites. On my ring finger, I used four coats of Frost Bites alone under a coat of Gelous. But get this: the other 3 fingers didn't get a topcoat. And this stuff was smooooth. Like a freshly waxed baby. You can totally get away with a regular topcoat for this. (as much as I love Gelous, you really don't need it.) I don't know what kind of sorcery this is, but I hope he keeps it up! In the title, I stated it was "limited edition". It really is. There are five other bottles in existence. It was created to announce an awesome sale for his shop: 15% off all orders!